There's always something to make! October is breast cancer awareness month! When I found out that KitchenAid is donating $1 to Susan G. Komen for every original picture of a cupcake baked and shared, I had to jump on board. Since pink is the color for breast cancer awareness, I decided to make the pinkest cupcake I can possibly make. With a pink velvet cake base and strawberry frosting, the cupcake is already pink. 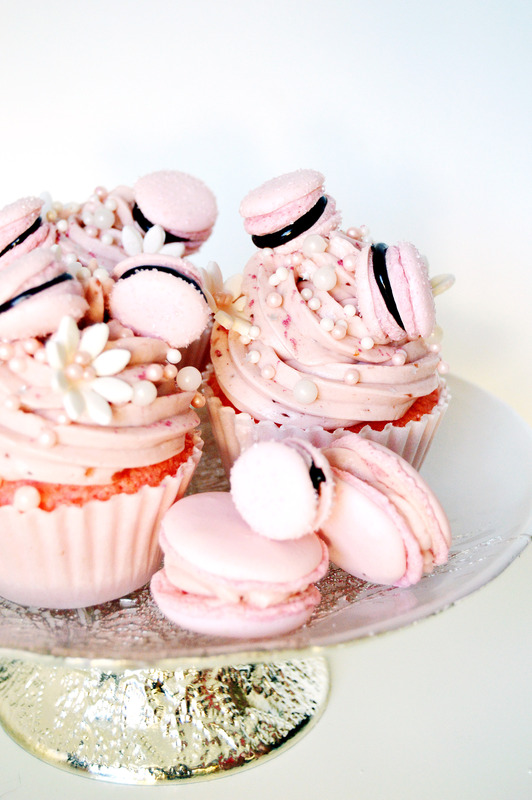 But once topped with tiny sparkling pink macarons sandwiched with chocolate ganache (macarons are my favorite! ), pink and white colored edible pearls, edible silver stars, gumpaste flowers and specks of pink shimmer, it is filled to the brim with all things pink and white. Of course, you don’t have to decorate the cupcakes like I did. 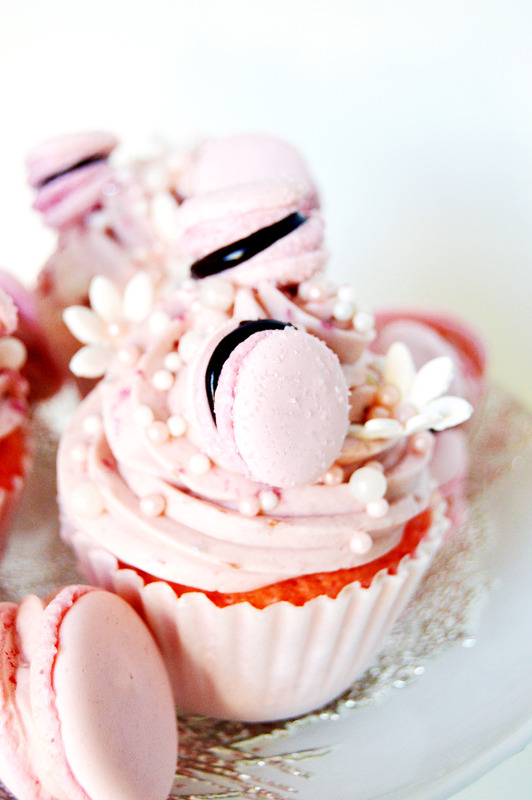 The pink velvet cake, strawberry frosting, ganache and macarons are all delicious individually and together. And I encourage you to try your own combination of flavors and components to make your own unique creation. So here’s to all to those who are fighting, supporting, hurting, recovering, helping, treating and healing from breast cancer or with a loved one with breast cancer. You are stronger than you think. On a pink velvet cupcake, with a 1M Wilton frosting tip, frosting a swirl of strawberry frosting. Sprinkle with edible pink and white pearls and sprinkle silver stars and pink shimmer dust. Top with two pink mini macarons and two gumpaste flowers. Preheat oven to 350˚F. Line two muffin pans with cupcake liners. In a medium bowl, mix both flours, baking powder, and salt. Set aside. In the bowl of a standing mixer fitted with the paddle attachment, beat butter on medium speed for 30 seconds. Add sugar and vanilla and beat until light and fluffy. Add eggs one at a time until incorporated and beat in food coloring. Alternately add flour mixture and buttermilk to egg mixture on low speed. Fill cupcake liners two-thirds full. Bake 15-17 minutes until toothpick inserted in the center comes out clean. Cool pans on wire racks for 10 minutes. Remove cupcakes from pans and cool completely before frosting. In a small pot, cook strawberries and lemon juice on medium heat until mixture thickens and reduces 1/3-1/2 of the original volume, about 5-10 minutes. Once thickened, put in a bowl to cool and refrigerate. In a saucier pan, put milk, salt and flour and whisk until combined on medium heat. Continuously whisk mixture until thickened to a pudding like consistency. Once thickened, strain through a mesh strainer into a bowl with a spatula to remove lumps. Place a piece of plastic wrap on top of the flour mixture and put into the fridge until fully cool. In a mixer bowl fitted with the whisk attachment, mix the sugar and butter on high speed until fluffy and pale about, 5-10 minutes. Add the chilled flour mixture and continue to whip on high speed until the sugar is completely dissolved and the mixture is no longer gritty, about 5-10 minutes. Mix vanilla frosting with ½ of strawberry puree until the mixture turns strawberry pink and fluffy. Give mix a taste and if not flavored enough, add puree ¼ at a time until desired flavor is reached. Line four baking sheets with parchment paper or a silicone mat. In the bowl of your food processor, add the almond meal and powdered sugar and pulse until thoroughly combined. Sift the mixture over a large mixing bowl, throwing out the lumps as they appear. Add 82 g. of the egg whites and stir until you get a thick mixture. In a small pot attached with a candy thermometer, combine the sugar and water over medium heat and boil until the syrup reaches 200˚F. Once the syrup reaches 200˚F, start whipping the remaining 90 g. in the bowl of your stand mixer with the whisk attachment on medium speed until soft peaks are reached. Once the syrup reaches 248 degrees, remove the pot off the burner and slowly pour the syrup down the side of the mixing bowl with the egg whites on medium speed. Once the egg whites are fully incorporated, increase the speed to medium high until egg whites form glossy, stiff peaks. Add two drops of the pink gel food color and mix until batter turns a light shade of pink. Mix a ⅓ of the egg white mix to the almond mixture and stir together until the batter is slightly lighter and less pasty. From then on, fold in ⅓ of the egg white mixture at a time until the mixture “flows like magma”. The mixture should be smooth and run thick ribbons off the spatula. With a pastry bag fitted with a ¼ in. plain tip, pipe mini macarons by squeezing the pastry bag with slight pressure. The piped batter may have peaks but should smooth away in a minute or two. Let the batter stand until the tops of the macaron batter have dried*, about 30 mins to 1 hour. 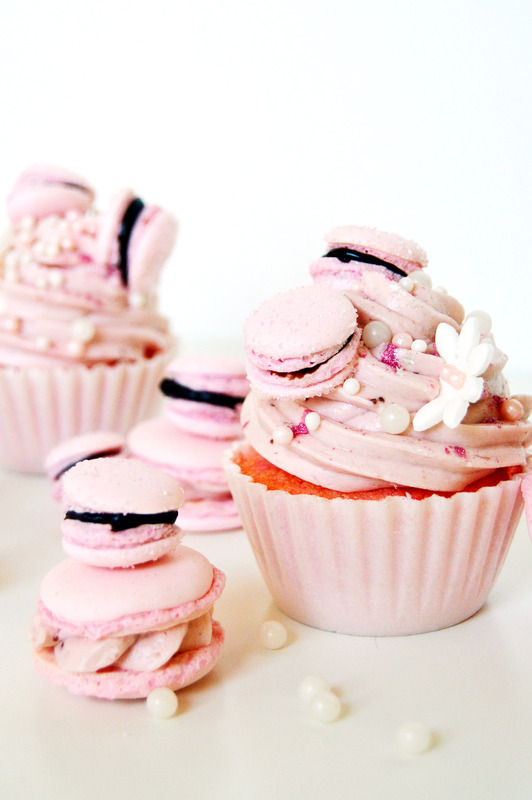 Optional: If using pink sparkling sugar, sprinkle it on top of macaron batter after the batter is piped. Preheat the oven to 275-325˚F. If your oven tends to run hot, go for 275˚ if not then 325˚. Bake 10-13 minutes, until the feet are formed and the tops are smooth. The batter is done when you slightly wiggle it and it starts to come off of the parchment paper / silicone mat. Let cool and fill with chocolate ganache filling. In a heatproof bowl, pour heavy cream on top of chocolate and microwave for one minute. Let stand 3 minutes and stir until combined. Let mixture cool in the fridge and stir every 4-5 minutes until the ganache is firm enough to be spread onto macaron shells. This entry was posted in Chocolate, cupcakes, Desserts, Strawberry and tagged #10000cupcakes, chocolate, cupcakes, dessert, kitchenaid, Macarons, strawberry. Bookmark the permalink. And so CUTE! Really love it! Damn girl! I mean YESSSS to this photography Giselle! Like I can see nothing but these gorgeous pictures right now, Imma hit you up for details and how you do it in sec. Let me go up and finish reading first..
You’re the sweetest ever.. ❤ Thank you!! These are the most fancy and gorgeous cupcakes I have ever seen. Talk about couture! Thank you, Lily! lol I agree, they’re quite fancy!! Yes, you are sweetest ever! Thanks to provide these gorgeous cupcakes recipes. I will try these one by one. Really you have provided such a helpful list of recipes. With the help of a stand mixer you can make more delicious recipes. Now I have decided to buy a stand mixer in India. As you have also mentioned Kitchenaid, I am also thinking to buy KitchenAid Stand mixer. Can you please provide me information about kitchenAid In India or KitchenAid website in India? Now I will be able to know about stand mixer prices and specification in India. Thanks a lot again. Yes I will try new recipes.